A Valley mother has been arrested and charged with murder after she reportedly gave methamphetamine to her nearly 2-year-old daughter. Phoenix police report that on April 13, Natalie Renee Russell, 30, left a 120-milligram bottle of liquid methadone within reach of her children. They say that her young daughter, Adalynn was found by her mother unresponsive and not breathing. The bottle of methadone was nearby and empty. Police report that instead of seeking medical attention, Russell did internet searches for information about methadone. 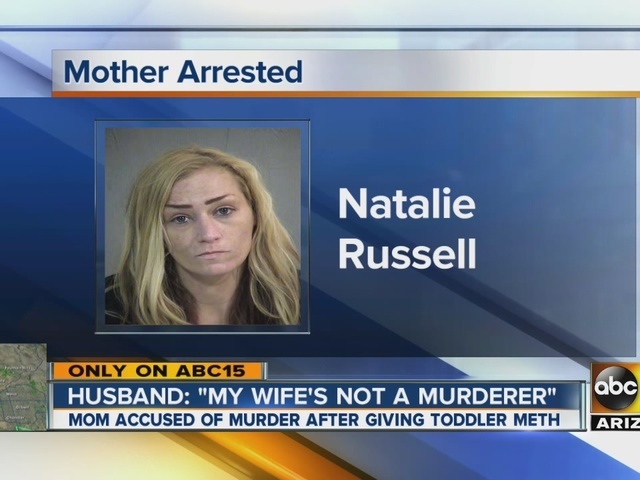 A witness reportedly told police that Russell told them she was going to give her daughter some methamphetamine to counter the effects of the methadone. This witness says they saw Russell give Adalynn the methamphetamine. The girl was pronounced dead the next day by the Phoenix Fire Department. 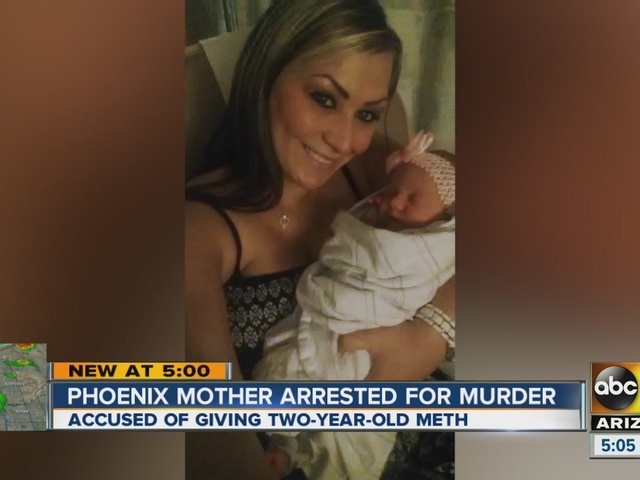 The Maricopa County Medical Examiner's Office says the autopsy showed that the child was found to have "toxic levels of methadone and methamphetamine in her body." Russell was arrested at a home in Gilbert near Gilbert and Baseline roads on July 26. 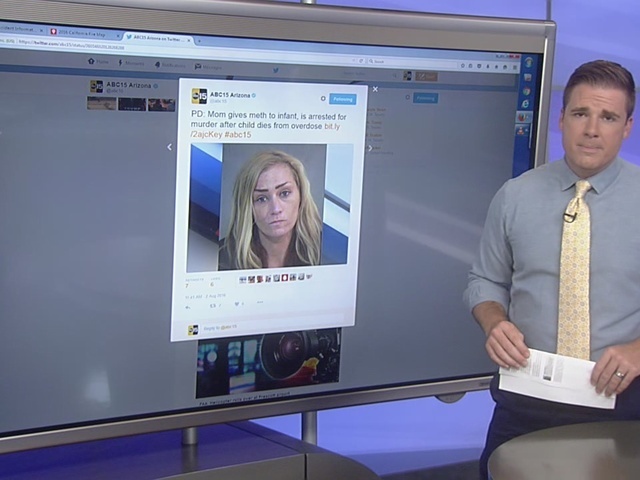 She has been charged with first-degree murder and two counts of child abuse. "The Arizona Department of Child Safety is confirming that DCS had previously investigated allegations of neglect involving Adalynn Russell, the child who died April 14th, 2016, and her mother, Ms. Natalie Renee Russell, who was arrested by Phoenix Police on July 26th, 2016. Prior to Adalynn’s birth, there were two reports of neglect against Ms. Russell involving her children. Those were unsubstantiated and services were offered. On December 3, 2014, a report was received alleging neglect to Adalynn and one of her older siblings by their mother, Natalie Russell and each of their fathers. The children were removed from the home and the Department filed a dependency petition with the Maricopa County Juvenile Court. The allegations were substantiated. The Department was providing services to the family when the following three subsequent reports were received. On January 7, 2015, a report was received alleging neglect to Adalynn and a sibling by their mother, Natalie Russell, Adalynn’s father and the kinship placement provider. The allegations were unsubstantiated and the Department continued providing services to the family. On August 8, 2015, a report was received alleging neglect to a newborn sibling by the mother, Natalie Russell and the father. The allegations were unsubstantiated. The Department continued providing services to the family. An in-home dependency petition was filed regarding the sibling. The mother successfully completed services and the children were reunified was reunified with Ms. Russell per court order. The dependency relating to all of the children was later dismissed by the court. On February 4, 2016, a report was received alleging neglect to Adalynn by her mother, Natalie Russell. The allegation was unsubstantiated and the case was closed. Adalynn was found deceased by Ms. Russell on April 14, 2016. All of the dedicated staff of DCS grieve over the tragic loss of this child and offer our thoughts and prayers for her family. We take our responsibility for protecting children very seriously, but we cannot predict the future. It is a heartbreaking reality that people are capable of doing great harm to children. DCS is committed to ensuring justice for this victim and will assist law enforcement in every way possible."